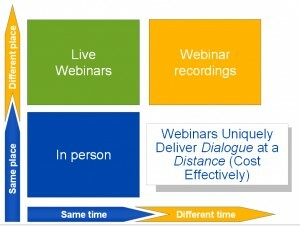 Can you live without web seminars? More than once I've presented for the American Marketing Association on the subject of "Irreplaceable Webinars." The primary education of the presentation is that we as marketers think in terms of segmentation, and that should include thinking psychographically in terms of time and place - our audience gets information in different ways at different times. Ergo, presenting virtually becomes an indispensable part of the communications mix. Unlike teleseminars, web and/or video conferencing add multi-sensory (visual) components to live, distance communications. And because the activity is snychronous, the power of dialogue explodes your opportunity to deliver influence ~ and what marketer, sales person, or trainer isn't attempting to create a certain outcome? 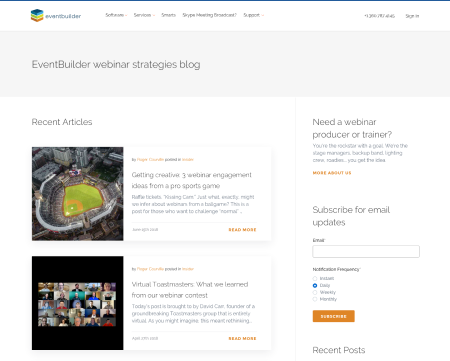 Webinars/webcasts/web seminars don't replace in-person meetings, seminars, and events. But don't get trapped into thinking that a recording is the same thing.